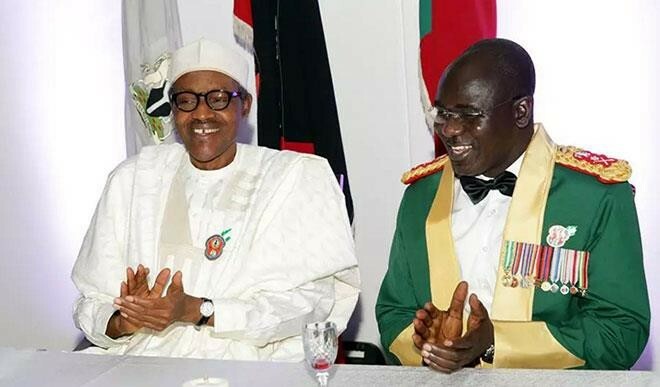 President Muhammadu Buhari on Tuesday, received security briefing from the Chief of Army Staff, Lt. Gen. Tukur Buratai. The Chief of Air Staff, Air Marshal Sadique Abubakar, also briefed Buhari. The briefing took place inside the President’s office at the Presidential Villa in Abuja. Speaking with the State House correspondents after the meeting, Buratai said he met with Buhari, to brief him on the operations the Army is involved in. He said: “I visited the Commander-in-Chief to update him on the security situation that the Army is involved: defending the territorial integrity of the country, the welfare of the troops and the state of our general administration. Abubakar on his part, said the meeting was routine. He added that he briefed the President on happenings in the Air Force, and that since he is the Commander-in-Chief, he has the right to know. Why is the Chief of Navy not in the meeting? The Almighty God always disappoints the devices of the crafty, and their hands will not be able to carry out their enterprises.